Organizations are adopting a new class of operational systems called Decision Management Systems to meet the demands of consumers, regulators and markets because traditional systems are too inflexible, fail to learn and adapt and crucially cannot apply analytics to take advantage of “Big Data.” Decision Management Systems, as I described in my book, are agile, analytic and adaptive. They are agile so they can be rapidly changed to cope with new regulations or business conditions. They are analytic, putting an organization’s data to work improving the quality and effectiveness of decisions. They are adaptive, learning from what works and what does not work to continuously improve over time. To respond to this growing interest, Decision Management Solutions has released the first version of its new Decision Management Systems Platform Technologies Report. 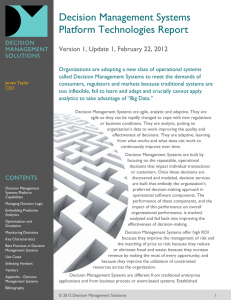 This report is prompted by the growing interest by organizations in Decision Management Systems. It is always challenging to draw the boundaries around such an exciting and growing area, but for practical purposes it must be so. For this report, we are focused on platform technologies used to build custom Decision Management Systems and our goal is to be comprehensive within this scope. Obviously, established approaches and technologies play a role in the development of Decision Management Systems. Used alone, however, these technologies and approaches tend to deliver systems that are inflexible, static and opaque. To fulfill the promise of agile and adaptive systems that fully leverage “big data”, organizations will need to expand their enterprise architecture to include capabilities from the proven technologies described in this report. Tested and established in many industries, technologies suitable for developing Decision Management Systems include Business Rules Management Systems, data mining or Predictive Analytic Workbenches and Optimization suites as well as new in-database analytic infrastructure and more. The report describes these product categories and identifies the key capabilities of these technologies. Best practices in their use and key use cases are identified and discussed. A complete list of vendors in the market is provided and an appendix provides more detail on Decision Management Systems. It must be noted that many vendors have developed powerful pre-configured Decision Management Systems focused on solving specific decision problems such as loan underwriting, claims handling or cross-channel marketing. I have reviewed many such applications here on the blog and for many organizations these solutions are ideal but they are not the focus of this report. Similarly there are vendors that build custom Decision Management Systems for their customers and that have developed powerful platforms for doing so. If such a platform is not for sale to those building their own solutions then it is out of scope for this report.